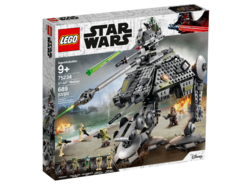 75234 AT-AP Walker is a Star Wars set released in 2019. Introduce your youngster to an amazing Imperial Walker and Clone Trooper! 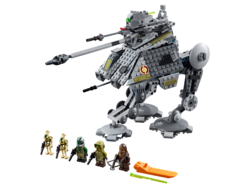 Includes 3 LEGO® Star Wars™ minifigures: Chewbacca, Clone Commander Gree and a Kashyyyk Clone Trooper, plus 2 Kashyyyk Battle Droid LEGO figures. Battle Droid Star Wars™ LEGO® figures feature new-for-January-2019 head decoration and torso color. Recreate action-filled Star Wars™: Revenge of the Sith style Kashyyyk battles! Imperial walker Star Wars™ building toy measures over 9” (24cm) high, 11” (29cm) long and 5” (15cm) wide. Facts about "75234 AT-AP Walker"
This page was last edited on 9 February 2019, at 22:16.